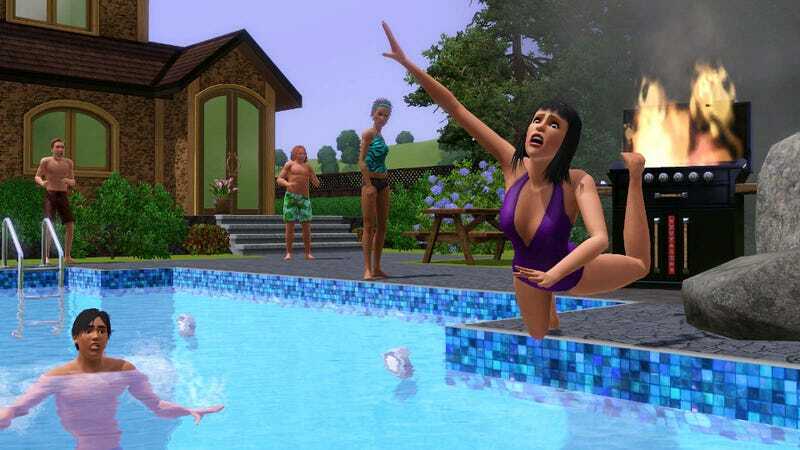 The Sims 4 isn't going to launch with pools or toddlers, and people are pretty upset about that. But you know, toddlers are complicated. Makes sense that the developers might want to put that effort elsewhere. Pools, though? They're just water. How hard could it be? I asked producer Graham Nardone why it's so tough to dig a ditch and fill it with water in The Sims 4's new engine, and he broke it down. The short answer? The game's engine, as is, simply isn't built to support things like digging into ground or Sims easily moving up and down within it. "It's easy to look at something and think, 'That looks pretty simple.' When you think about a feature like pools upfront, it looks like a square box on the ground and you put a shader on the top surface and have Sims jump in." "But ultimately, it's more complexity in terms of what tech's there and what isn't there, what we have to build to support this. How do we cut down into the terrain, how do we get Sims going through portals across different levels of pools? There's so much that's going on in the background that you don't end up seeing just to have a Sim go swimming." Will pools get added in eventually, though? Based on all the Sim-trapped-in-pool-esque wailing and gnashing of teeth from fans, it seems pretty darn likely. "It's not a matter of it not being important to us or our focus not being in the right place. As we chat with fans and they continue to inform us of what they want, they're obviously interested in pools and toddlers. They want those in the game. So we'll continue to listen to feedback, something we've always done with The Sims." "I'd really just say look at what we've done in the past. We've had a variety of different ways we've delivered content to players, and I think we'll continue to support what they're looking for." I further asked if the confirmed-but-not-really-explained Sims 4 Premium option might in any way be involved, but again Nardone declined to elaborate. "That's just not something we're really getting into yet," he said. "Right now we're focused on the base game. Once we're out on September 2nd, we'll start looking toward what's next." So there you go. No pools for now, but they might (read: probably will) show up at some point in the future, and they may (or may not) cost money. Nardone skirted frustratingly close to offering a non-answer, but I guess now we've got a fraction of something to go on. We'll see. I recently played The Sims 4 and had a lot of fun performing evil experiments on my hapless household, but then I developed a conscience and became a real boy. That was a good time, but it's impossible to deny that Sims 4 will—at least initially—lack a lot of features both big and small from previous Sims games. Fingers crossed for a good experience despite the small army of possible red flags just over the hill. At this point all that's left is to wait and see. And tell EA what you want, of course. They may or may not listen, but it never hurts to ask.